Just weeks after the Navy grounded its favorite fleet of unmanned spy copters, the admirals announced that they're spending another quarter-billion dollars to buy even more of the drones. Manufacturer Northrop Grumman will get $262,336,248 to provide the Navy with six MQ-8B Fire Scout copters and test two more. The single-sourced contract comes two weeks after the Navy put the drone helos on an indefinite timeout after discovering what it described as "two unrelated operational mishaps." Those mishaps: One Fire Scout was recently unable to land on the U.S.S. Simpson due to a malfunction following a routine surveillance mission, and another crashed during a different spy mission in northern Afghanistan. The Navy's still investigating what went wrong. But those weren't the only problems with the drones. A Pentagon audit found last year that Fire Scouts completed a mere 54 percent of their missions aboard the U.S.S. Halyburton. The Navy and Northrop portrayed the new contract as a way of turning the Fire Scout program around from its recent woes. 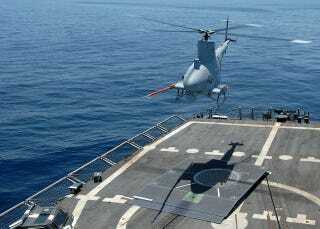 "This endurance upgrade award is intended to satisfy an urgent operational need," said Northrop Grumman spokesman Warren Comer, and "any correction or change made on the MQ-8B program will certainly be evaluated for incorporation into the new MQ-8C," the upgraded version of the drone. Jamie Cosgrove, a spokesperson for the Navy, said the new Fire Scouts Northrop's providing will "provide an endurance upgrade to support maritime special operations forces," who are indeed rather busy these days. But the current generation of Scouts will "continue to support existing efforts and [Littoral Combat Ship] mission packages." Grounding the Scouts is indeed a precautionary measure. That precaution underscores the importance of the helicopter to the Navy. It spies on drug smugglers in Latin American waters; spies on insurgents in Afghanistan; earned its combat stripes in Libya; and its surveillance on the Simpson occurred in Africa. By the end of the year, the Navy expects to strap the Fire Scout with weapons. That is, if it gets back off the deck any time soon. Northrop and the Scout's advocates in the Navy have objected that the standards for considering the Fire Scout a failure are a bit precious. Last year, Rear Adm. Bill Shannon, who's in charge of unmanned systems for the Navy, said there's a no-fail culture in weapons-system testing that can make a successful system seem like a lemon. "If I'm out on a five-hour mission, and on the return home, there's a 10-minute drop-out in the video - to call that an incomplete mission, that defies common sense," Shannon told an industry conference in August. It's a fair point. But it's also a short step from there to tolerating more substantial failures. And that's how the Navy both ends up with a fleet of drone helicopters it suddenly considers too risky to fly - and keeps shoveling money into a program that's literally, if temporarily, stuck on the flight deck.